The Gossamer Wind Ceiling Fan is EnergyStar rated and incorporates an advanced blade design that greatly improves energy efficiency. I always stress that the design of a green home must start with the passive-solar-design elements before even thinking about the mechanical systems. If you focus on the overall efficiency of the entire building, you can then reduce or eliminate the electrical/mechanical systems—such as heating and cooling. My straw bale home is designed to stay comfortable on hot summer days without the need for a conventional air conditioner. This is accomplished by careful window placement to prevent solar gain in the summer, well-insulated straw bale walls, R-55 cellulose insulation in the ceilings, and the use of interior thermal mass walls. When the overall building is designed properly, you may find that you only need to reduce the interior air temperature by a few degrees—instead of twenty or more degrees. A ceiling fan may then be all that is needed to make a room feel comfortable. In the case of my straw bale house, a conventional air conditioning system would not only be unnecessary, it would also greatly increase the cost of the off-the-grid photovoltaic system that supplies all of the electricity for the home. Ceiling fans have made a comeback due to their energy efficiency. They were invented in the 1860’s to 1870’s and were the standard method of making buildings more comfortable for decades. By the mid 1950’s, electric air conditioners began to appear in homes and the sales of ceiling fans waned. An electric motor spinning a propeller-type fan blade uses a lot less electricity than an air conditioning system that has both blowers and compressors. Dropping the apparent temperature of your skin is much easier than cooling an entire room. Ceiling fans work by evaporating moisture off your skin with moving air, just as a summer breeze can make a hot day seem quite comfortable. The Gossamer WInd ceiling fan is in a class by itself. The blades were designed by Aerovironment, the same company responsible for the design of the the fist successful human-powered aircraft and various electric-powered aircraft—both manned and unmanned. 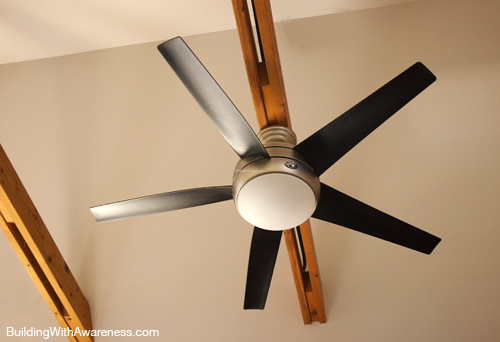 Most ceiling fan blades are are made from a flat, thin piece of wood that is mounted at an angle to the rotation. This pushes air downward as the blade rotates. Blades such as this are easy to manufacture but not particularly efficient at moving the air. To solve this problem, the ceiling fan blade designed by Aerovironment—and incorporated into the Gossamer Wind ceiling fans—is inspired by aircraft propellor blades. The blade incorporates a twist with a steeper angle at the base as compared to the tip (see the above photo). 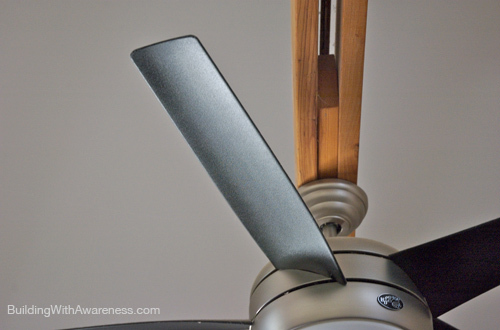 The base of a fan blade spins at a slower velocity than the tip, so by increasing the angle at the root, a larger volume of air is moved at any given point on the blade. Less electricity is used as the blade can rotate at a slower speed while still moving the same amount of air of typical ceiling fans at higher speeds. Airflow performance is increased by up to 100%. The Gossamer Wind ceiling fan has three-speeds, is EnergyStar certified, and includes a dimmable fluorescent bulb. The fluorescent bulb uses less electricity and generates less heat than the typical incandescent bulbs found in most ceiling fans. The unit also includes a remote control with a temperature gauge that can turn the fan on at a pre-determined room temperature. I find that this fan moves as much air at medium speed that a conventional ceiling fan moves at high speed. I usually run the fan at the slowest speed. This is usually sufficient to make hot summer days feel quite pleasant. Having become used to seeing an intelligently designed fan blade, conventional blades now look clunky in comparison. 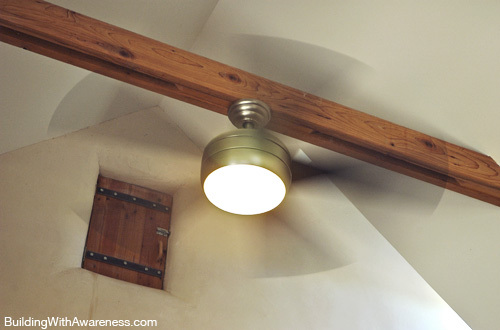 In addition to aiding in cooling in the summer, the direction of ceiling fans can be reversed in the winter in order to blow down the warm air that has accumulated at the top of the ceiling. Where can one of these fans be found? Home Depot no longer carries them. I was just in our local Home Depot and saw the model that was reviewed. You might take a look at the Home Depot website and see if you can order it. We just ordered two of the industrial versions (they were not carried by the local store) of this energy efficient fan for our office. We hope to review them within a few months. Do yo know where I can buy this fan? Nice post!! Thanks for sharing this info. I like that fan. That’s really nice article and thanks for sharing. I love that ceiling fan.